It happens every year around this time. Someone asks if I want to hunt pigs, or fish sturgeon, or if I want some elk or moose or somesuch. The answer is always a polite but firm “no.” While I like doing all these things, and I appreciate being thought of, the simple fact is that my freezers runneth over. Both of them. And I cannot justify killing something when I am in such a position. I can thank my mom for this. She is a quintessentially thrifty Yankee from Massachusetts who instilled in all of her children a fierce rejection of waste. There is an old Depression-era quote that goes something like, “use it up, wear it out, make it do, or do without.” I try to live by that. I have strong memories of mum forbidding me to eat more oranges or buy more books until I had finished those she’d bought me previously; then and now, I have always been a notable eater of citrus as well as a voracious reader. Sometimes I still marvel at how I came to this hunting, angling and gathering life of mine. I remember distinctly a conversation I had with my friend Chris Niskanen, more than a decade ago. I’d posited that, even given state and federal possession limits, one could live off fish and game fairly easily. You’d just need to be ecumenical about what it was you hunted and ate. Niskie argued that fish, and game especially, wasn’t something to be hoarded. It was something to be enjoyed within the season, a marker for the passing of a year. When I moved to California in 2004, I set out to prove my point. And I did. I haven’t bought meat or fish more than a handful of times — mostly stray octopuses and the rare chicken — since that date. A look at the recipes on Hunter Angler Gardener Cook will tell you what I eat: Venison, waterfowl, wild pigs, upland birds. Salmon, sturgeon, stripers, rockfish, lingcod. Shellfish, mushrooms, wild plants. It’s a good little life. At first, I drew up overly complicated calculations about how many pounds of this or that Holly and I would need to collect to “make it through” a year — as if there were no supermarkets nearby. But within a couple years the calculus changed. Holly and I each became much better hunters, and our situation switched from one of scarcity to abundance, even over-abundance. We eat duck several times a week from October to January, and still we end the season with a full possession limit of duck, not to mention a couple dozen geese or so. What is enough? It is a strange feeling when it first comes over you. It first manifested itself in me by a strong urge to not shoot marginal ducks, just to run up numbers. I didn’t need to shoot my limit of seven. A pair of pintail or mallards or fat wigeon would do. (It is important to note that this feeling normally doesn’t show itself until Christmas, a full two months into our season.) A full freezer is physical evidence of this. It is a statement that says: You have succeeded in providing for yourself and your family. Now go do something else. Initially, that something else is to process the meat and fish in various ways. That’s why I have entire sections on this website for smoking fish or making sausages and curing meat. But over the years I find myself eating less and less cured meat. Sure, I still like to eat it, but do I really need 50 pounds of salami? Does anyone? I hear you. You’re asking me why I don’t share my bounty with the neighborhood, or with friends? I do. But just as I don’t hunt to feed coyotes, I don’t hunt to foist game and fish on my friends and neighbors. Sure, when the salmon run strong I am never at a loss for takers, but wild duck and venison can be challenging to cook for the uninitiated, so my takers are fewer. And as it happens, my block is loaded with hunters and anglers, so we all seem to find ourselves in the same boat. Slowly, quietly, the answer seeps into me. Each year I hunt and fish I find myself calmer and more confident about my ability to have enough game and fish to suit my needs. I no longer feel the need to shoot limits of ducks every time I venture into the marsh, and I am finding myself taking less experienced hunters out more often, donating many of my birds to them at the end of the hunt. For me, there is always another day. For them, this might be their only time in the field. In fishing season I often stop well short of a limit because I know I will not be able to eat what I catch before I have to freeze it — and, since I may well be fishing again in a few days, I might as well leave the fish alone. I’ve even gotten to this point with mushrooms. I could have picked ten times the weight of morels I harvested last season had I wanted to, and could have sold them to boot. But I didn’t. Foraging for money taints an experience that borders on the spiritual for me. It doesn’t mean I never do it, but I find myself doing it less and less as the years go by. All of this leads me to my point: Find equilibrium. Know what you need from nature and take no more. I know many of you will disagree. You find great happiness in shooting 200 ducks a year, or in shooting a half-dozen big game animals or catching scores of tuna or salmon. There is nothing wrong with any of this — if you, or a friend, or a neighbor eats it all. But mind your freezer. You killed everything in it, and it deserves your care and attention when it comes to finishing the task of hunting or fishing. 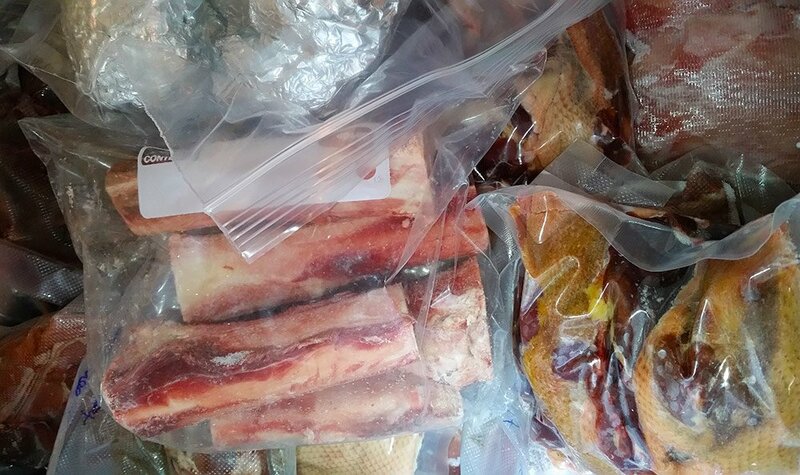 And just as a full freezer is a sign of success, the space created by eating it down week by week will feed your hunger to get back out there and enjoy what the new season offers. Niskie was right. Have you ever thought of forming a loose coop/barter/food share with folks who procure different food than you? I know I share some of the fish I catch with an elderly couple who are always sending me home with homegrown produce or home cooked meals. I’m sure there are a lot of folks who would love to trade for some of your charcuterie. I completely agree with you, Hank. I catch and eat fish (bluegills, perch, crappies) frequently in the spring/summer in Michigan, and enjoy many great meals during that time, but I rarely freeze any fish filets. In the winter, we spend time at the Texas Gulf Coast, and I catch and eat my fill of black drum, seatrout, and redfish while I’m there, but I never haul any frozen filets back home. Doing it this way, I look forward to the great fresh fish meals every year in each place. I do (in most years) have quite a bit of venison in my freezer, which I enjoy eating through the winter months, but even that is usually long gone before the next deer season. my father taught us fifty years ago, that there was no hunting without respecting and using the creatures you hunted. I still remember my brother glumly contemplating the tiny roast mousebird he’d shot with a pellet gun – Dad made him cook and eat it.. ha. Thank you for the article. It has given me a new reason for gratitude. I’m such a lousy hunter and fisherman that I’ve never had the problem of a full freezer: so I’ve never had to limit my time fishing and hunting. Fortunately for me the time afield is my primary reward. Excellent Essay. I have not yet managed to eat only the meat and fish I hunt and catch – but that is where I want to go. This essay has encouraged me to work on this goal harder. Thx!